I could not have been less excited about the prospect of a third Cars movie. Most would say it is fair to classify this now trilogy as the weakest link in the ever-growing Pixar brand, but I don't bring this up to quickly cut down the third installment in this franchise that has borne nothing more than extended or unnecessary narratives, but rather to commend it for stepping up its game with what is likely the last chapter largely featuring Lightning McQueen if not the beginning of a new generation of Cars films as Cars 3 actively attempts to correct much of what has dragged these films down to sub-par Pixar levels from the beginning. In 2006, an idea such as a world filled with talking vehicles and a story that paid homage to the racing world, where it'd been, and where it might be going was an inspired enough one especially considering the combination of Disney and Pixar had yet to fail to meet if not surpass expectations. There seemed so much energy and so much enthusiasm for this first endeavor and while, having re-watched that first film recently, Cars is certainly a fine enough experience it didn't transcend the genre of animated movies in the way many of its predecessors had. Rather, Cars was more along the lines of an animated movie made strictly for the kiddos rather than one that had the ability to both appeal to the children in the crowd as well as emotionally resonate with their parents. That isn't to say it didn't try, but it is in the same kind of middle area where the purpose is present yet the payoff doesn't totally work that we find Cars 3. Many will agree Cars 2 was a total misstep and deviated from what at least made the first film charming and even if the Cars movies didn't make them buttloads of cash via merchandising it would seem Pixar might be intent on course correcting for the sake of artistic credibility as Cars 3 makes a genuine attempt to steer this franchise back into the arms of what inspired it in the first place-the good ole open road. While we are eleven years down the road from the first Cars in the future the dynamic will be rather jarring as the original Cars and Cars 3 more or less bookend the career of McQueen; chronicling both how he learned to be the racer he always aspired to be as well as helping him cope with the passing of time, the passing of the baton, and understanding there might be more to life than crossing the finish line first. Lightning McQueen (Owen Wilson) finds a new competitor in the young and more advanced Jackson Storm (Armie Hammer). We are re-introduced to Owen Wilson's Lightning McQueen in the midst of yet another racing season where McQueen is having the time of his life competing with friends and fellow racers all while engaging in healthy competition. In essence, there couldn't be a better time to be McQueen as he's hit his stride, found his happy place, and is reveling in it-that is, until he and his peers are blindsided by the likes of newcomer Jackson Storm (Armie Hammer) who is part of a new generation of racers that come with advanced technology giving them the ability to reach blazingly-fast speeds. McQueen quickly sees the tide turning as those friends and fellow racers he once lovingly competed with begin to retire or are replaced with younger, sleeker models that are leaving the legendary McQueen in the dust time and time again. Pushed out of the sport he loves, McQueen finishes the season in a questionable state-a blaze, but by no means a blaze of glory. In what is the wreck that has been the staple of all of the promotional spots for the film McQueen is sent into the off-season in a disheartening state with the question of if he'll ever race again looming large. Does he attempt to train harder in hopes of getting faster and competing with this new line of automobiles or does he accept his stage of life and go out with what of his legacy is still intact? After retiring back to Radiator Springs to collect his thoughts we come to see McQueen grappling with some rather existential questions considering this is a film about anthropomorphic cars and other such vehicles. Still, with the help of his longtime friends Mater (Larry the Cable Guy) and Sally (Bonnie Hunt) McQueen decides to get back up on the horse (or whatever motor vehicle stands in for this animal in this world) and approach his training from a different angle in hopes of being able to compete at the new level now required. To do this McQueen's previous sponsor's, the Rust-eze brothers, sell their company to a wealthy super fan named Sterling (Nathan Fillion) who takes McQueen under his care, turns him over to his number one trainer, Cruz Ramirez (Cristela Alonzo), and gives him one last chance to prove his worth or prove that his racing career really has run its (last) course. Right out the gate, Cars 3 feels more interesting and more intriguing than its predecessors and that is largely due to the fact it seems to be a more assured film than either of those previous installments. It has a confidence about it that owns the fact this is a weird world of sorts and that there could be countless questions and holes in how these cars did in fact come to be anthropomorphic, but Cars 3 kind of pushes all of that to the side and simply embraces the world for what it is and uses it to serve as this metaphor for the workings of human society and the nature of those who exist within it. Not to get too heady, the movie certainly doesn’t, but it was rather refreshing to see Lightning McQueen and his crew tackle a more complex transition in life through a certain, somewhat specific perspective that a children’s animated movie wouldn’t normally tackle. 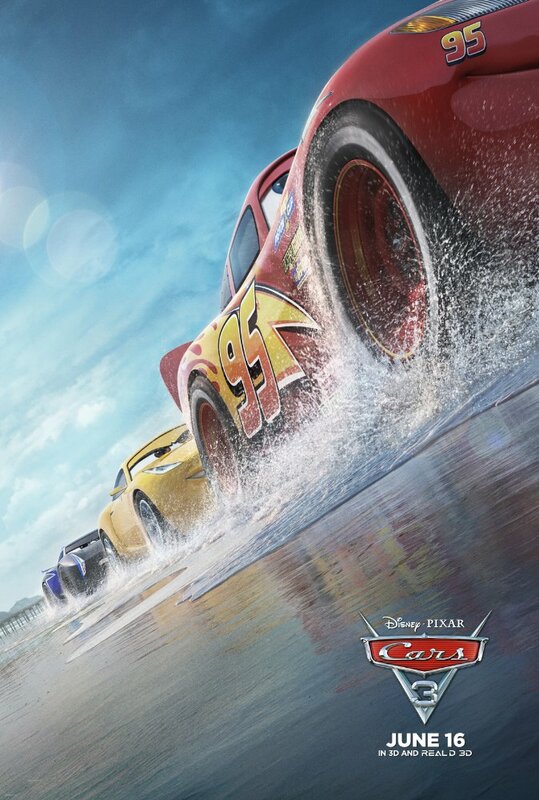 Of course, children’s animated movies likely haven’t covered such territory largely because it isn’t very identifiable to that target demographic, but Cars 3 lets us know very early on that it’s taking on something a little more mature if not exactly something that is out of Pixar’s wheelhouse. In doing this, director Brian Fee (who is making his directorial debut) let's those in the audience who are mature enough to crave more than colorful cars racing back and forth know that there will be something more to grasp onto. As someone who fell asleep while trying to re-watch the two previous films before catching up with this one in theater's I found a striking and immediate difference in the fact I was automatically engaged in this new plight of McQueen's and curious as to how the movie might allow him to handle it. Of course, what has always been the detriment to the Cars universe is the fact it is hard to make one's self care about or invest in the emotions of an automobile. One could say it's similar to how we might be sympathetic to the situations of a Terminator or other A.I., but by virtue of the fact these are humanoid cars-things that can be repaired and replaced in a somewhat inconsequential manner-it remains more difficult to draw that line between the cars and ourselves than it does their circumstances and our own. So, how does Cars 3 handle this obstacle? In its earnest attitude. Seriously, Cars 3 is trying its damnedest and it's that quality-that yearning to impress that shines through this time around making McQueen and the host of new characters that join him in this outing at least worth noting. No fear, as McQueen also finds a new friend in Cruz Ramirez (Cristela Alonzo). Speaking to the characters and those that provide a beating heart within the parts that make it up, Wilson is doing his thing in the way that he is present, but never invested enough to come up with anything fresh to add to that of his leading car. One might could glean something in the actor's voice that indicates he understands the transition his character is facing as he too is trying to navigate the waters of a career that once found it easy to play the bro or laid-back best friend, but who is now finding it more and more difficult to nail down such work. More interesting is the dynamic the film builds between McQueen and Ramirez as it isn't necessarily a friendship we see coming, but proves to be a fruitful one despite the clear fact of what Disney and Pixar are actually doing. Through Alonzo's energetic performance Ramirez comes to be a sense of comic relief and understanding. Never does it feel as if Alonzo is trying too hard to be humorous in the way Larry the Cable Guy's Mater does and it's evident the creators were keen to edge Mater out of the spotlight a bit after he wore out his welcome in the second film. That said, Mater still gets a few jokes in here and there as does most of the rather stellar voice cast they've assembled that also includes the likes of Orange is the New Black's Lea DeLaria as a monster school bus named Miss Fritter, Kerry Washington as a racing analyst named Natalie Certain, and Chris Cooper filling in the Paul Newman role as Doc Hudson's friend and mentor, Smokey. Speaking of ol' Smokey, it is when the film takes both the high stakes and the accompanying pressure away from its two main characters and forces them into a kind of seclusion to find themselves and get them back to their roots-remind them of what made them fall in love with racing in the first place-that the movie kind of finds itself too. The movie always had its seemingly good intentions on its side and that certainly counts for something, but it is in the sequence where we see McQueen meet some of his own heroes (the way Ramirez sees McQueen) in the form of Louise Nash (Margo Martindale), Darrell Cartrip (Darrell Waltrip), and River Scott (Isiah Whitlock Jr.) that we see him realize there is a path for racers past their prime and this resonates something resembling shades of real heart rather than an overlong commercial. Cars 3 is still too long and some sections drag while others do in fact feel like extended pitches as to why your kids will want certain toys, but Fee and his team also make sure to give the film a sliver of sincerity and when combined with some of the genuine fun and flawless animation it's not so hard to take the good with the bad.